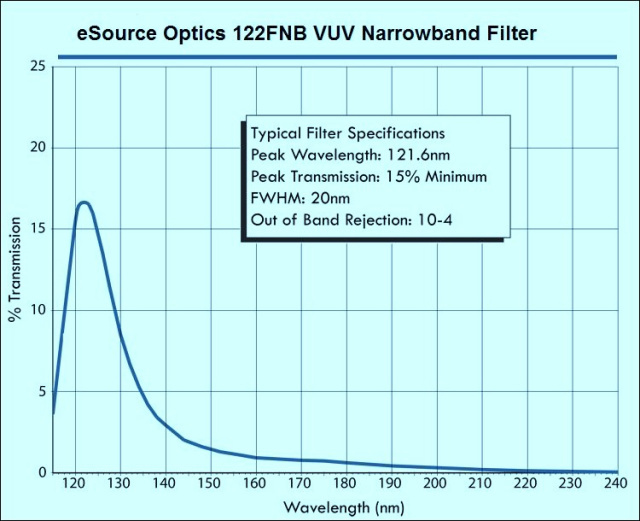 eSource Optics Vacuum Ultraviolet (VUV) Optical Bandpass Filters are available at specific peak Vacuum UV (VUV) wavelengths as short as the 122nm Lyman Alpha line up to 214nm. Narrow Bandwidth VUV Optical Bandpass Filter designs are available designated as "FNB" having a ~20nm FWHM. Popular Vacuum Ultraviolet (VUV) Analytical and Laser Lines are available including 122nm Lyman Alpha line, 155nm Carbon IV (C IV) line, 158nm Fluorine (F) Laser line, 172nm Xenon (Xe) Laser line, 184.9nm Mercury (Hg) Lamp line, 193nm Argon Fluoride (ArF) Laser line & 214nm Zinc (Zn) line. Other Vacuum Ultraviolet (VUV) wavelengths are available upon request. All VUV Optical Bandpass Filters are available in standard 12.7mm, 25.4mm, and 50.8mm Diameters. Broad Bandwidth VUV Optical Bandpass Filter designs are also available designated as "FBB" having a ~35-50nm FWHM . 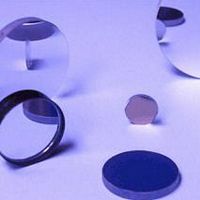 VUV Optical Bandpass Filters are metal-dielectric-metal (MDM) design thin-film VUV bandpass filters supplied as Unmounted and Open-Faced Filters. Open-Faced VUV Optical Bandpass Filters are manufactured using high purity VUV grade MgF2, CaF2 & Quartz substrates for VUV wavelengths 121.6nm to 160nm. 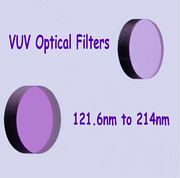 Open-Faced VUV Optical Bandpass Filters are manufactured using high purity UV grade Fused Silica substrate for VUV wavelengths 170nm to 214nm. More information can be found on our Material Properties Page. Both VUV bandpass filter types are over-coated with the MDM filter coating. All VUV filter substrates are highly polished to a <20-10 scratch & dig surface quality with less than 3 arc minutes parallelism. All eSource Optics VUV Optical Bandpass Filters are supplied with individual Vacuum UV % Transmission Calibration Curves detailing normal incidence VUV-UV spectral performance characteristics. VUV Optical Bandpass Filters are mainly used in VUV D2 light source applications requiring a narrow spectral bandwidth and a high signal-to-noise ratio. Open-Faced VUV Optical Bandpass Filters are fairly soft and must be handled with due care. For added durability and protection from the environment, VUV bandpass filters from 170nm to 214nm can be special ordered with a UV Fused Silica cover window that is edge sealed to the Open-faced VUV bandpass filter. For more information on covered & edge sealed VUV Optical Bandpass Filters and/or VUV filter peak wavelengths not listed below, please contact eSource Optics.